Addis Ababa is the capital city of Ethiopia and the African Union and is often called the "African Capital" due to its historical, diplomatic, and political significance for the continent. Located in the foothills of the Entoto Mountains and standing 7,726 feet (2,355 meters) above sea level, it is the third highest capital in the world. It is located in the geographic center of the country. When the city was at risk due to a shortage of firewood in the early 1900s, an ambitious campaign to plant Eucalyptus trees imported from Australia in and around the city essentially secured its lasting location. Today, a greenbelt of forests and semi-subsistence cultivated land surrounds the city. This historically significant city in its enchanting mountain setting is recognized as one of the world¹s most problematic, yet fascinating and beautiful cities. Its country's border war with Eritrea and unsteady relationship with Somalia have put a heavy burden on Addis Ababa as it has become a center for refugees whom it cannot support. Rapid population growth has created slums. Some areas have 200 people per acre, living in ramshackle attached houses built without regard to sanitation or drainage. In most areas the rich and poor live as neighbors, though many of the wealthiest people live in the southeast and southwest sections of the city. 5.1 City of humankind’s origins? Addis Ababa is an important administrative center not only for Ethiopia but also for the whole of Africa. The headquarters of the African Union and the United Nations Economic Commission for Africa can both be found in the city. The United States and the European Union both have two delegations in Addis Ababa, one for bilateral relations with Ethiopia and one for the African Union. Ethiopia and its capital city have become a source of pride for the Pan-African movement due to its indigenous character and the legacy of the Abyssinian Empire. This city's name is sometimes spelled "Addis Abeba," which means "new flower" in the Amharic language. Empress Taitu named the city, which is also known by the Oromo language name “Finfinnee.” Other parts of the city were called hora Finfinnee, meaning "hot springs." The city is located at the southern foot of Mount Entoto, in the Entoto Mountains, at an elevation of about 8000 feet (2440 meters) above sea level, on a plateau that is crossed by numerous streams and surrounded by hills and mountains, in the geographic center of the country. Mount Yarer overlooks the city from the east and Mount Wochecha from the west. The Entoto Mountains are home to numerous churches, a museum of religious costume, and a park. Ecologically, Addis Ababa is a grassland biome, which is a climatically and geographically defined area of similar communities of plants, animals, and soil organisms. The city possesses a complex mix of highland climate zones, with temperature differences of up to 10°C (50° F), depending on elevation and prevailing wind patterns. The high elevation moderates temperatures year-round, and the city's position near the equator means that temperatures are very constant from month to month. The temperature in January ranges from a high of 68°F (20°C) to a low of 53°F (12°C). The area of the city increased from 85.73 square miles (222.04 square kilometers) in 1984 to 204.7 square miles (530.21 square kilometers) in 1994. The Entoto Mountains start among the northern suburbs. Suburbs include Shiro Meda and Entoto in the north, Urael and Bole (home to Bole International Airport) in the east, Nifas Silk in the south-east, Mekanisa in the south, and Keraniyo and Kolfe in the west. Unlike many other African capitals, the founding, growth and development of Addis Ababa are not rooted in colonization. The modern city was founded in 1886, by Emperor Menelik II, at the site of a hot spring chosen by Empress Taytu Betul. Menelik, initially a King of the Shewa province, had found Mount Entoto a useful base for military operations in the south of his realm. Entoto, situated on a high tableland, was found to be unsatisfactory because of extreme cold and a shortage of firewood. Initially, Taytu built a house for herself near the "Filwoha" hot mineral springs, where she and members of the Showan Royal Court liked to take mineral baths. 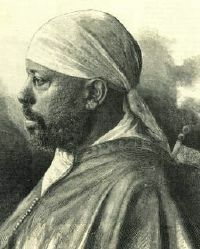 Other nobility and their staffs and households settled the vicinity, and Menelik expanded his wife's house to become the Imperial Palace, which remained the seat of government in Addis Ababa. The name changed to Addis Ababa and became Ethiopia's capital when Menelik II became Emperor of Ethiopia in 1889. The city grew around the emperor's palace, which was surrounded by the dwellings of his troops and retainers. The city was in danger of being abandoned in the early 1900s due to a shortage of firewood. The solution was an ambitious campaign to plant Eucalyptus trees, imported from Australia, in and around the city as a fuel wood and construction material. Today, a greenbelt of forests and semi-subsistence cultivated land surrounds the city. The completion in 1917 of the railway to Djibouti accelerated the city's somewhat haphazard and unplanned growth. 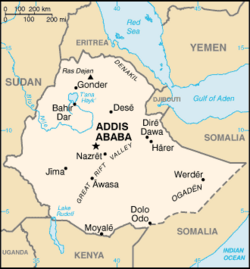 On May 5, 1936, Italian troops occupied Addis Ababa during the Second Italo-Abyssinian War, making it the capital of Italian East Africa from 1936 to 1941. Modern stone houses were built, many roads were paved, a water reservoir was built at Gefarsa in the west, and a hydroelectric station at Akaki to the south. 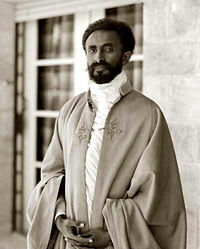 After the British army and the Ethiopian patriots defeated the Italian army during the East African Campaign in Ethiopia Haile Selassie, who was Emperor from 1930, returned to Addis Ababa on May 5, 1941, and immediately began the work of re-establishing his capital. Growth occurred in three waves after the Second World War, with the largest population boom during the late 1960s, as rural to urban migration reached its peak. Between 1960 and 1970 the population of the city nearly doubled, and new light manufacturing industries were established. Emperor Haile Selassie helped form the Organization of African Unity in 1963, and invited the new organization to keep its headquarters in the city. Drought and famine that struck the country in the mid-1980s meant that hundreds of thousands fled economic misery, conscription, and political repression and went to live in neighboring—countries and all over the Western world—creating an Ethiopian diaspora. When Eritrea, a former province of Ethiopia, gained independence in 1991, thousands of peasants and villagers fled, settling in large numbers in Addis Ababa. Many of the sick and maimed flocked there, along with a huge number of children who had lost parents to the war. These destitute migrants formed the lowest class of beggars and street vendors. In 1991, over 100,000 street children lived in Ethiopian cities, mostly in the capital. The OAU was dissolved in 2002 and replaced by the African Union, also headquartered in Addis Ababa. The United Nations Economic Commission for Africa also has its headquarters in Addis Ababa. The city was also the site of the Council of the Oriental Orthodox Churches in 1965. Addis Ababa is one of two self-governing administrations in the nine ethnically based states that make up the Federal Democratic Republic of Ethiopia. The nation is unique among African countries, in that the ancient Ethiopian monarchy maintained its freedom from colonial rule with the exception of the 1936-41 Italian occupation during World War II. Ethiopia is the oldest independent country in Africa and one of the oldest in the world—at least 2,000 years. 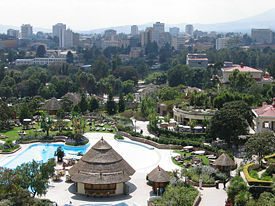 Addis Ababa has the status of both a city and a state, with a charter endorsed by the national government. The Mayor has responsibilities that include: primary, secondary, and college education; primary health care, health centers, and hospitals; policing, water supply and infrastructure. The city council, which is elected directly every five years, provides the mayor with a cabinet, which functions to help the mayor in decision-making. The economic activities in Addis Ababa are diverse. In 2007, some 119,197 people in the city were engaged in trade and commerce; 113,977 in manufacturing and industry; 80,391 homemakers of different variety; 71,186 in civil administration; 50,538 in transport and communication; 42,514 in education, health and social services; 32,685 in hotel and catering services; and 16,602 in agriculture, according to Ethiopian official statistics. The main industrial area is in Akaki, in the south-eastern part of the city, where the largest factories are located. Most industries are government-owned, although increasing numbers are privately owned. Manufacturing includes footwear, clothing, asbestos and metal products, processed foods, cement, and plywood. In addition to the residents of rural sections of Addis Ababa, the city dwellers also participate in animal husbandry and cultivation of gardens. In the early twenty-first century, 677 hectares (1673 acres) of land is irrigated annually, on which 129,880 quintals of vegetables are cultivated. Many poor Ethiopians from the rural areas come to Addis Ababa as beggars and fill some of the streets, although the number of beggars declined after a government attempt to move some of them and provide education and jobs. A vast open-air market known as the Mercato, on the western side of the city, is the site for trade of leather, metal, and textile goods from flourishing craft industries, and regional agricultural produce, such as coffee, tobacco, and dairy foods. It is the largest open market in Africa. The city has undergone a construction boom with tall buildings rising in many places. Also, various luxury services have become available and the construction of shopping malls recently increased. The popularity of day spas in the city led some people to call the city "the spa capital of Africa." Addis Ababa is the hub of a road network, and the terminus of a rail link to the Gulf of Aden port of Djibouti City, with a picturesque French style railway station. Buses or blue and white share taxis provide public transport. The city is served by Bole International Airport, where a new terminal opened in 2003. The old Lideta Airport in the western "Old Airport" district is used mostly by small craft and military planes and helicopters. 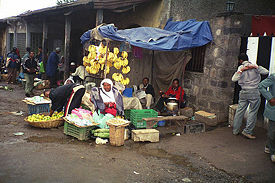 Street market in Addis Ababa. 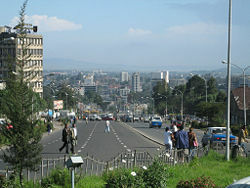 Addis Ababa had a population of 3,147,000, according to the 2007 census, consisting of 1,511,000 men and 1,636,000 women, and an eight percent annual growth rate. The city is home to 23.8 percent of all urban dwellers in Ethiopia, and has an estimated density of 5936.2 per square kilometer. It is the 106th largest urban area in the world, according to Demographia. Almost all the Ethiopian ethnic groups are represented in Addis Ababa due to its position as capital of the country. Close to half of the population are from the ethnic group Amhara, while the remaining population is predominantly split among the groups Oromo, Gurage, and Tigray. About 82 percent of the population are Orthodox Christians, 12.7 percent Muslims, 3.9 percent Protestants, 0.8 percent Catholics, while the remaining 0.6 percent are followers of other religions, such as Hindus, Jews, Bahá'ís, and Agnostics. Addis Ababa University was founded in 1950 and was originally named "University College of Addis Ababa," then renamed in 1962 for the former Ethiopian emperor Haile Selassie I who had donated his Genete Leul Palace to be the University main campus in the previous year. It received its current name in 1975. Although the university has six of its seven campuses within Addis Ababa (the seventh is located in Debre Zeit, about 45km), it also maintains branches in many cities throughout the country. It is the home of the Institute of Ethiopian Studies and the Ethnological Museum. The city also has numerous private colleges including Admas College,Ethiopian Civil Service College and Unity University College. Ethiopia has often been called the origin of humankind due to various hominid fossil discoveries such as the Australopithecine "Lucy." Northeastern Africa, and the Afar region in particular, was the central focus of these claims until recent DNA evidence suggested origins in south central Ethiopian regions like present-day Addis Ababa (Finfine). After analyzing the DNA of almost 1,000 people around the world, geneticists and other scientists claimed humans spread from what is now Addis Ababa 100,000 years ago. The research indicated that genetic diversity declines steadily the farther one's ancestors traveled from Addis Ababa, Ethiopia, which is roughly the site of the exit turnstile for the "out-of-Africa" migration. The fossilized skeleton, and a plaster replica, of the early hominid Lucy (known in Ethiopia as Dinkinesh) is preserved at the Ethiopian National Museum in Addis Ababa. The city is home to the Ethiopian National Library, the Ethiopian Ethnological Museum (and former palace), the Addis Ababa Museum, the Ethiopian Natural History Museum, the Ethiopian Railway Museum and the National Postal Museum. Notable buildings include St George's Cathedral (founded in 1896 and also home to a museum), Holy Trinity Cathedral (once the largest Ethiopian Orthodox Cathedral and the location of Sylvia Pankhurst's tomb) as well as the burial place of Emperor Haile Selassie and the Imperial family, and those who fought the Italians during the war. There is also Menelik's old Imperial palace which remains the official seat of government, and the National Palace formerly known as the Jubilee Palace (built to mark Emperor Haile Selassie's Silver Jubilee in 1955) which is the residence of the President of Ethiopia. 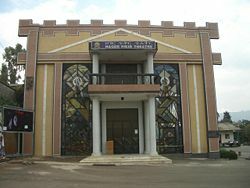 The Hager Fikir Theatre, the oldest theater in Ethiopia, is located at the Piazza district. Africa Hall is located across Menelik II Avenue from this palace and is where the United Nations Economic Commission for Africa is headquartered as well as most U.N. offices in Ethiopia. Near Holy Trinity Cathedral is the parliament building, which was built during the reign of Emperor Haile Selassie, and which continues to serve as the seat of Parliament. Opposite is the Shengo Hall, the world's largest pre-fabricated building, built by the Derg regime of Mengistu Haile Mariam as its new parliament hall. Near Bole International Airport is the new Medhane Alem (Savior of the World) Cathedral, which is the second largest in Africa. In the Merkato district is the impressive Anwar Mosque, the largest mosque in Ethiopia. Few meters to the southwest is the Raguel Church. The Roman Catholic Cathedral of the Holy Family is also in the Merkato district. Other features include the Jan Meda Race Ground racecourse, Bihere Tsige Recreation Centre, Addis Ababa and Nyala Stadium. The 2008 African Championships in Athletics were held in Addis Ababa. The city hosts the "We Are the Future" center for child care. Launched in 2004, the program is the result of a strategic partnership between the Glocal Forum, the Quincy Jones Listen Up Foundation and Mr. Hani Masri, with the support of the World Bank, UN agencies and major companies. ↑ 1.0 1.1 Addis Ababa Population World Population Review. Retrieved August 16, 2018. ↑ Tia Goldenberg, Massages and Manicures Hit Addis Ababa Independent Online, November 6, 2007. Retrieved August 16, 2018. ↑ Ryan Flinn, Humans Moved From Africa Across Globe, DNA Study Says Bloomberg.com, February 21, 2008. Retrieved August 16, 2108. ↑ Dee Chisamera, DNA Links Humanity To One Common Origin: Africa eFluxMedia, February 22, 2008. Retrieved August 16, 2018. ↑ David Brown, Genetic Mutations Offer Insights on Human Diversity Washington Post, February 22, 2008. Retrieved August 16, 2018. Ethiopia Ethiopia, World Fact Book. Broad Support of Mayor's Overhaul of Addis Ababa City Mayors. This page was last modified on 21 August 2018, at 15:29.